UDM Downloads > Audio Transcoder! Audio Transcoder is a one-stop audio converter and music CD ripper for Windows OS. Featuring support for more than 20 audio formats, the program can export audio to almost any format, be it rare or common. 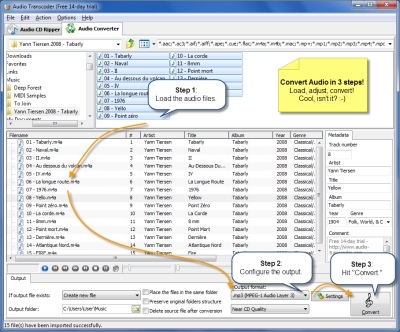 Embedded audio converter allow to convert wma to mp3, wma to mp4, wv to mp3, wav to mp3, mp4 to mp3, rip cd to flac, convert mp4 to wma, ape to flac, mp2 to mp3, wv to mp3, flac to mp3. As an added bonus, there is an embedded CD ripper to rip CD music tracks and save them to more common digital music formats. Unique to Audio Transcoder are its abilities to convert and rip audio in 3 mouse clicks, phenomenal accuracy of conversion and super-fast processing speed. The program has only a little impact on system performance. Audio Transcoder is unique thanks to the rich library of supported formats. At present, it can work with over 20 file formats, such as mp3, aac, ac3, wma, ape, aiff, wav, flac, m4a (iPod aac and Apple Lossless), mac, mp+, mp1, mp2, mp3, mp4, mpc, mpp, ofr, spx, tta, wav, wv and Ogg-Vorbis.The authors regularly add support for new formats, making the audio converter a universal tool to convert audio and rip CD music. Downloading music from the Internet, or ripping CD music tracks is part of the daily life for most anyone. It is mp3 converter, mp4 converter, cd ripper, mp4 to mp3 converter, flac converter, audio grabber, wma converter, mp3 ripper, wav converter, aac converter, audio ripper, m4a converter, mp3 convertor, ogg converter, audio convert, ogg to mp3 converter, audio convertor, mp3 audio converter, ape converter, flac ripper, mpc converter, ac3 converter.